The L.I.F.E. Scholarship Committee is pleased to announce the scholarship winners for 2018. Every year the L.I.F.E. Foundation receives applications from individuals who have been diagnosed with Lupus and are enrolled in higher education programs across the United States. Each Applicant has their own story to share about his/her own struggles and perseverance of being young and living with an unpredictable life threatening disease and how he/she faces the challenge each day with positivity and triumphs to inspire others. After careful consideration, the following students have been selected as a recipient of the 2018 L.I.F.E. Scholarship. Congratulations! Thank you to all who applied for a L.I.F.E Scholarship. The L.I.F.E. Scholarship Committee encourages all applicants who did not receive a scholarship to re-apply next year. Destin touches the lives of those around her, and is a positive presence that engages with warmth and compassion. During the summer of 2017 Destin Thomas was a soon-to-be 23-year-old senior at Kennesaw State University. 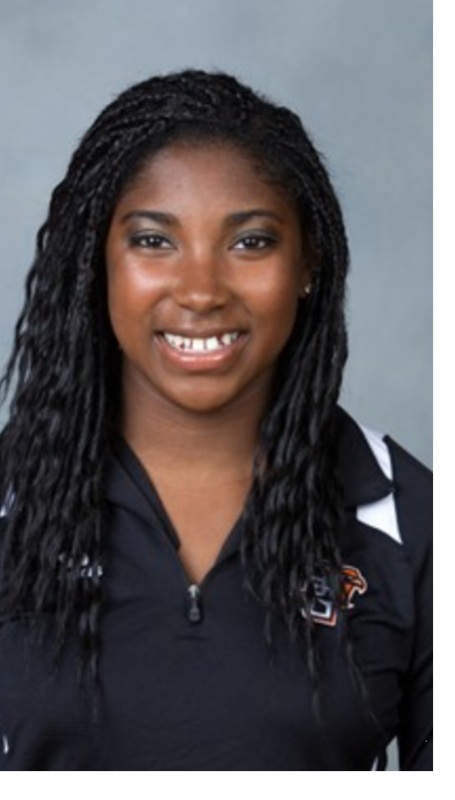 Destin was diagnosed with lupus during her first year in college, which led her to apply for a L.I.F.E. Scholarship. Although she was not offered an award at that time, Destin did not give up. Despite her frustrations, she demonstrated the remarkable fortitude to persevere. Accordingly, Destin made academic, physical, and personal gains that inspired others who witnessed her growth. Even through her days of darkness from lupus - the wolf within – Destin’s positive presence became a magnet of hope for other young adults faced with adversity. The L.I.F.E. Scholarship Committee applauds applicants that show persistence by re-applying. Destin Thomas was one of our students that reapplied not just once, but twice. For three consecutive years Destin’s application showed improvement. However, it was not just the improvement that caught the eyes of our L.I.F.E. scholarship committee. Destin’s pure determination to put her best foot forward each year, for 3 consecutive years, showed the committee her potential to lead others in the same manner. After our thorough review of all application materials, we were markedly impressed. Destin gave the committee a wonderful snippet of how she constantly applied herself to overcome adversity. Her grades consistently improved and her essays were thoughtful and unique. Each year Destin inspired her recommenders. The first year of college is a crucial time in any young adult’s life. Although it is a time to broaden foundations of knowledge and understanding, for many students it also delivers independence, self-discovery, and an awareness of cultural differences and identity. Learning that you have a chronic, potentially life-threatening, autoimmune disease is life-changing. It can threaten who you are—how you seek to define yourself. Lupus is a game changer for many people, and Destin was no exception. At first, she struggled to accept the limitations it imposed. Between flares and exhaustion, it was emotionally taxing to adjust to. Negativity clouded her life, as it can for others with this disease. She had to learn to be patient with herself and be honest about her condition to herself and others. Destin inspires others without them even knowing she has lupus, and when they do discover this fact, she becomes even more inspirational. The L.I.F.E. Team would like to thank Destin Thomas, not just for persisting to apply for this scholarship, but for her choice to fight the good fight: for being the encouragement when people most desperately need it, and for being the kind soul that motivates others to make the best of all situations. For this, we are proud to announce Destin Thomas as a well deserving 2017 sponsored L.I.F.E. Scholarship Winner. Her story is one that will continue to be told year after year. “Destin, like our other courageous winners, is a positive role model for future students with lupus. And she epitomizes the heart and soul of this organization.” –Jodi Norton, President and Co-Founder of L.I.F.E. We hope Destin’s journey with lupus will encourage our previous L.I.F.E. 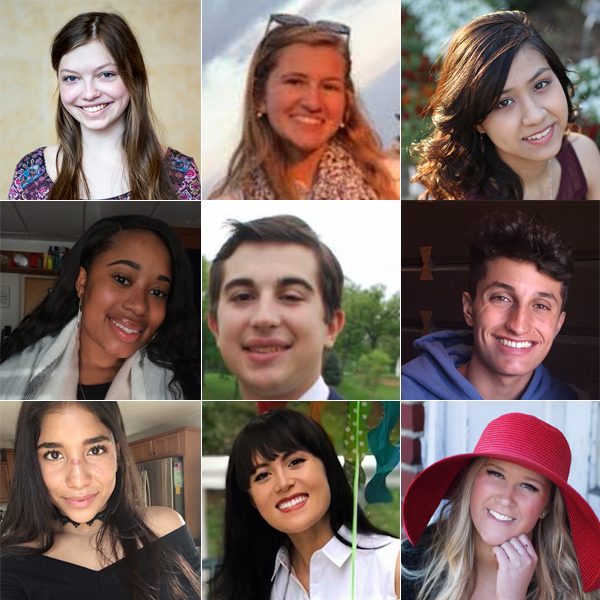 Scholarship finalists to re-apply, especially if they are growing stronger and can show through example how the impact of the “cruel mystery” of lupus has changed their trajectory in life for the better. Written by: Jodi Norton, President of L.I.F.E. Right Way Medical is often inspired by the stories they hear and the people they meet. Recently they connected with Jodi Norton, a customer of Right Way Medical. While helping Jodi with the items she needed, Right Way was able to connect with her and learn more about her life. They profiled Jodi on their website. Click here to view the profile. The L.I.F.E. Scholarship Committee is pleased to announce the 28inspirational finalists for consideration of the 2017-2018 Scholarship Award. Being selected as a finalist is a considerable honor as the competition is at an all-time high. Thank you to all of our applicants for sharing your story and for continuing to persevere despite the setbacks of lupus. The final selection of winners will be contacted by telephone in September by a member of the L.I.F.E Scholarship Committee. The L.I.F.E. Awareness Award furthers L.I.F.E.’s twofold mission of promoting lupus awareness by awarding merit-based scholarships to students in all 50 states. Each year in support of May Lupus Awareness Month, L.I.F.E. selects an inspirational applicant as the winner. Through this L.I.F.E. Awareness Award, more scholarships will be provided in areas less represented or states that have never received a L.I.F.E. Scholarship. This is a great way to spread awareness of a frequently misunderstood disease across the country and fulfill the L.I.F.E. Team’s goal to be represented and known in all states. 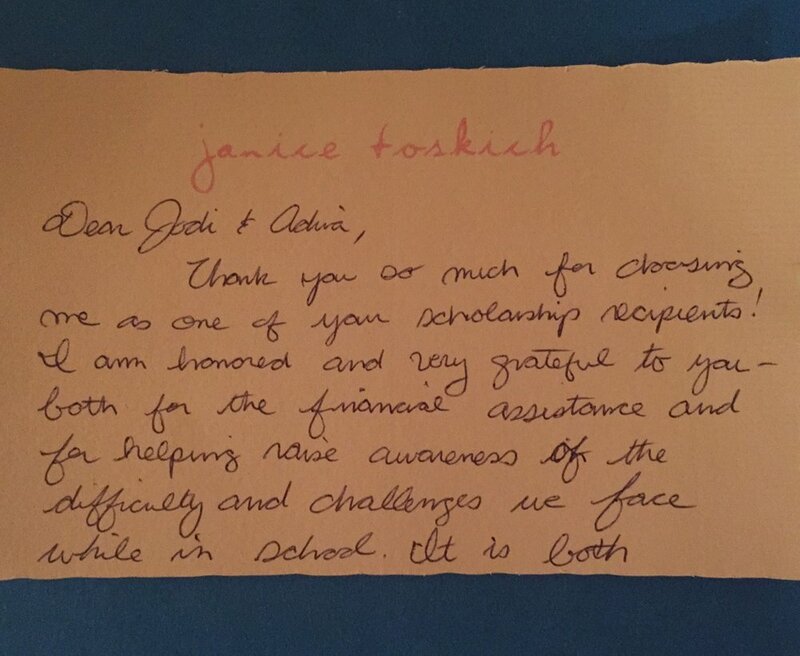 Jean Bassett from Arizona has been a loyal sponsor of scholarships since L.I.F.E.’s President & Co-Founder, Jodi Norton, initiated the Foundation’s first Sponsorship Program in 2014. L.I.F.E. is gracious for Jean’s support and excited to announce Caroline Boccuzzi as the sponsored winner for the 2017 L.I.F.E. Awareness Award. The winner of this sponsored scholarship is typically selected during May in honor of Lupus Awareness Month! Caroline has been described as joyful, optimistic, driven, reliable, and respectful of others by those who have witnessed her perseverance and strength during her tenure at Westhill High School in Stamford, CT. Caroline’s achievements stand on their own. She is a member of the National Honor Society and the National Spanish Honor Society due to her consistent and excellent academic records. Caroline has also been awarded the Fairfield University Book Award recognizing her prestigious standing in the community at Fairfield University. By any means, Caroline is accomplished. At the age of fifteen, Caroline was diagnosed with Systemic Lupus Erythematosus. Lupus is a chronic inflammatory disease occurring when the body’s own immune system attacks its own tissues and organs. This disease has many manifestations creating a difficult environment for an individual to succeed. Caroline not only overcame her struggles to achieve outstanding success but she has used this platform as a catalyst to be more involved in her community. Caroline has “been empowered by this condition to help others.” She lends her time as a mentor to others facing the same diagnosis as herself, to elementary school kids as a mentor and tutor, and has spent time volunteering in nursing homes. Caroline has been a member of the Mayor’s Youth Leadership Committee which allowed her to bring awareness to social issues in her community. She has lent a helping hand with her high school as a part of the Learning and Development Crew (LanD), a mentorship program for incoming freshman. 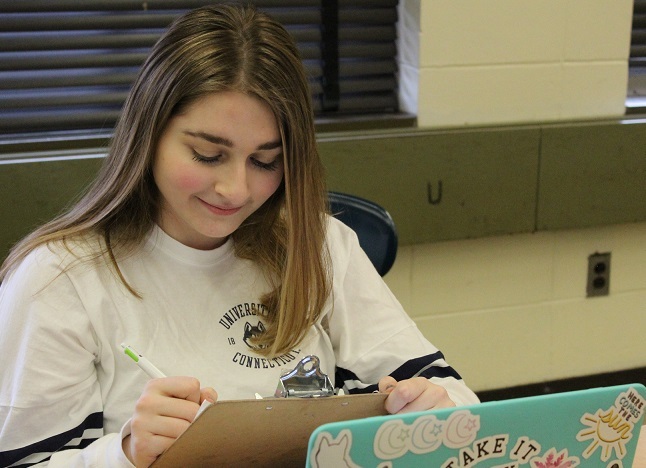 Caroline has shown great determination and academic skill in her dedication to her classes even when lupus has caused her to interrupt her schedule. In addition, Caroline exudes compassion and awareness for the struggle of others. 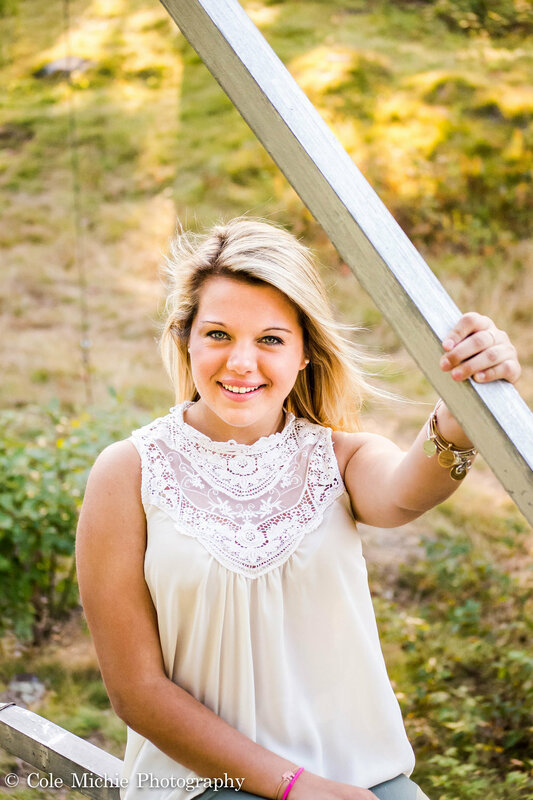 As Managing Editor of her award winning high school newspaper and intern for Jade Marketing Solutions, Caroline has begun to pursue her professional interests. Caroline’s diagnosis has become a bridge, connecting her to others and we are optimistic that she will continue to do so with an excellent college education at the University of Connecticut. We are proud to offer her the 2017 L.I.F.E. Awareness Award and we wish her all the very best in her endeavours. 1. Although the postmark date for completed application materials is July 1st, 2017, it is helpful for applicants to try apply as early as possible. Thank you for your help. 2. When requesting a letter of recommendation, make sure you pick wisely, give deadline and plenty of notice to your chosen non-related recommender and thank them for their time. Give information about L.I.F.E. and the criteria for the award. 2. Past Finalists or applicants that still qualify are encouraged to reapply. 4. The L.I.F.E. Team has decided not to have an application fee at this time. Best of luck to all 2017 Applicants! To support Lupus Awareness Month, L.I.F.E. will be posting a new and updated medication section on our website. It includes something interesting for everyone. For example, want to know the common types of medications used to treat lupus? Or want to know in simple terms the mechanism of a class of medications used to treat lupus? Or an interesting fact about a drug? Or adverse side-effects of a medication you or someone you love is taking? Or how the benefits of antimalarials were discovered by our US troops? L.I.F.E. President, Jodi Norton and 2014 L.I.F.E. Scholarship Recipient Jacqueline Saunders have teamed up to provide an amazing medication section for our website. 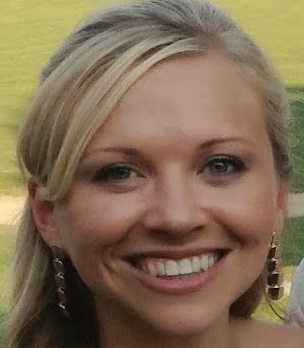 Jacqueline is currently a student at Ferris State University, College of Pharmacy and was not only a 2014 L.I.F.E. Scholarship Recipient but also a 2015 recipient of the L.I.F.E. Degree Completion/Scholarship Renewal Scholarship and a member of the Honorary L.I.F.E. Program for her efforts to give back. L.I.F.E. is thankful for the numerous hours Jacqueline provided as a way to give back to an organization that helped her reach her goal to become a pharmacist and once again give back to the lupus community. The L.I.F.E. Team gives a special THANK YOU to our honorary winner Jacqueline. 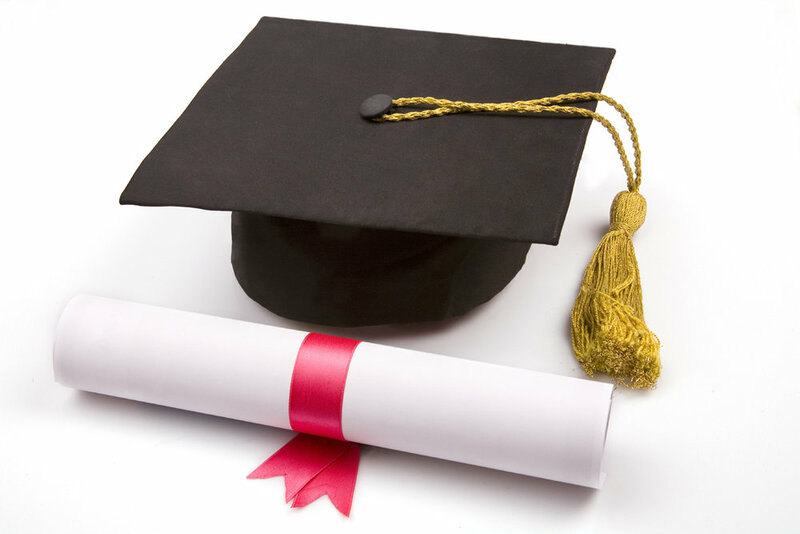 Please note that beginning this year, in addition to mailing a hard copy of your scholarship application, all students must also submit a scanned electronic copy via email to life4lupuscholarship@gmail.com. For more information about eligibility and application requirements, please visit our Apply For A Scholarship page. Best of luck to all of our 2017 L.I.F.E. Scholarship applicants! Thank you to all who applied for a L.I.F.E Scholarship. After careful consideration, the following students have been selected as a recipient of the 2016 L.I.F.E. Scholarship. Congratulations! The 2016 L.I.F.E. Scholarship Committee is pleased to announce 29 inspirational finalists for consideration of the 2016 Scholarship Award. Being selected as a finalist is a considerable honor as the competition is at an all-time high. Thank you to all of our applicants for sharing your story and for continuing to persevere despite the setbacks of lupus. With school just around the corner, what better way to shop for back-to-school clothes and help make a difference in another student’s life. L.I.F.E is committed to helping students with lupus reach their goal of obtaining higher education through merit-based scholarships and YOU can help today. L.I.F.E. is excited to partner with Macy's for their 11th Annual Shop For A Cause fundraiser! Be a helping hand to our inspiring students that have faced adversity at such a tender age. You may know of someone with lupus - in recognition, help L.I.F.E. make a difference! It only takes $5 to make a difference… in return you will be inspired by the students we have been helping across America since 2002! Note: Your ready-to-print Savings Pass will be sent to the email listed in your order (please allow up to 24 hours to receive your Savings Pass). What is Macy’s Shop For A Cause? Non-profits across the country participate by selling special Macy's savings passes for $5 each, keeping 100% of the proceeds for their mission! Savings passes are valid at all Macy's stores during the Shop For A Cause three day event, August 26th - August 28th. What is the Savings Offer? Purchase your Savings Pass Now! When purchasing, please provide your email address so that we can send you your ready-to-print Macy's Savings Pass. It's that easy! *If you are donating on behalf of a student, please write their name in the provided slot. Thank you on behalf of L.I.F.E. and all our scholarship recipients for supporting us and students across the country. 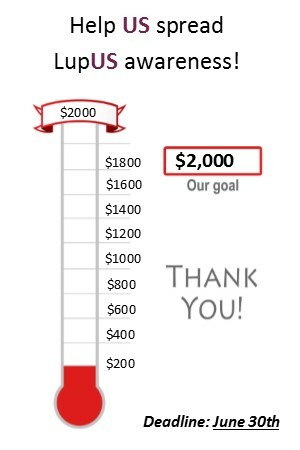 Your continued generosity has made it possible for L.I.F.E. to award over 100 scholarships to students in more than 30 states across the country! Below are just a few of our outstanding 2016 Winners. The remaining winners will be announced in September. "They asked me if I needed protection from my parents and it was at that point that I realized they too didn’t believe I was truly in pain and this made me very upset. Just because I wasn’t fitting into their textbook diagnoses I must be a hormonally teenager looking for attention." "As a person with lupus I understand that life can be unfair but over the years of having supporting family and friends I’ve been able to cope with my disability and turn everyday into a positive day." Thank you to all our 2016 scholarship applicants! The demand for L.I.F.E. Scholarships is at an all time high with over 100 applications received. The L.I.F.E. Scholarship Committee is looking forward to reviewing all of the amazing applications and will announce the Finalists in the next month. The L.I.F.E. Scholarship Committee is run entirely by volunteers and with over 10 pages of material to thoroughly review per person, this places a large burden on our Scholarship Committee (many of our officers donate their time in addition to their full time careers). As of 2017, it will be mandatory for all of our applicants to submit two copies of their application: 1) a hardcopy via mail and 2) an electronic copy via email. If you are selected as a 2016 Finalist, you will be contacted via email and asked to provide us with a scanned copy of your 2016 application. Earlier this year, the L.I.F.E. Team decided to remove it’s application fee (all checks received were voided) to process each application, thus we are instead asking for our 2016 Finalists to provide us with electronic copies of their application (emailed to us at life4lupuscholarship@gmail.com). If you are selected as a Finalist and you can not provide a scanned copy of your application, we will scan it for you and no penalty will occur or hurt your chances of becoming a 2016 L.I.F.E. Scholarship Winner. Thank you to any 2016 Finalists that can help lessen our load. The L.I.F.E. Scholarship Committee thanks you for your patience during the application review process. L.I.F.E. is always in need of volunteers. Click here to become a volunteer today (link coming soon)! I still remember the call from Mike and Kellie asking me if it would be ok with me that instead of spending money on favors for their wedding guests, that they take the money and donate it to L.I.F.E. "Is that ok with you?" Kellie asked. I was diagnosed with lupus in 2008 at the age of 17, just a senior in high school. I’d never even heard of lupus before my diagnosis. In 2009 I was awarded a L.I.F.E. Scholarship and I have since then been working with this amazing organization to raise lupus awareness and award more scholarships to courageous students with lupus. 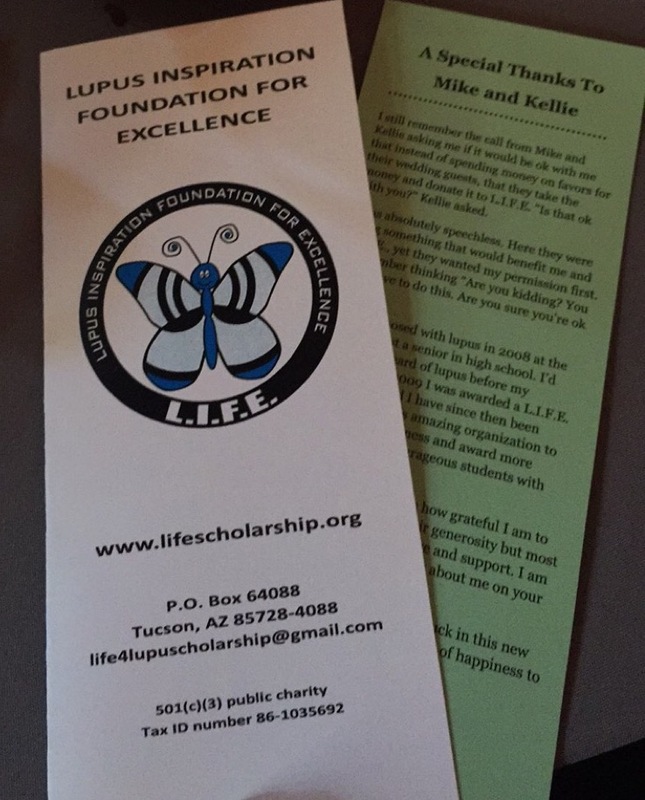 Mike and Kellie tied the knot on June 20, 2016, and on this special day they chose to take the money they would have spent on wedding favors and instead made a donation to L.I.F.E. With their donation, they have chosen to sponsor a deserving student in August. In addition, placed on each seat was a little card with L.I.F.E.’s name, description, and slogan (Helping those touched by lupus, one L.I.F.E. at a time) which they hoped would bring continued awareness. On July 7, 2006, less than one year later, Janice made true to her promise. Janice was to be married and instead of spending money on favors, like Mike and Kellie, they too chose to take the money and give back to L.I.F.E. 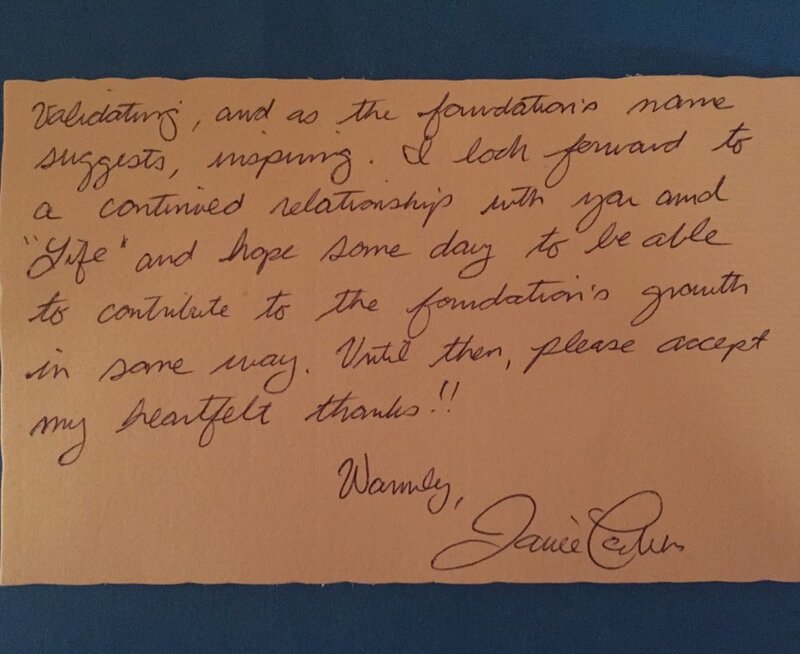 by making a donation so that another student could get the financial help, support, and recognition Janice received as a former L.I.F.E. Scholarship winner. On behalf of L.I.F.E. and all our scholarship recipients, we are grateful to all our generous donors. On a personal note, words cannot express how grateful I am to Mike and Kellie Lacerda (my cousins) for their generosity but most importantly for their love and support. If you or anyone you know is getting married and would too like to bring lupus awareness and donate to L.I.F.E., please contact us by email at life4lupuscholarship@gmail.com. Statement on behalf of President Jodi Norton: "What an honorable and self-less way to give to others that they [your cousins] do not know. I was thinking about the first time a L.I.F.E. winner did this exact thing for L.I.F.E.— Janice Shelton. I was incredibly touched by her act of kindness but she had a very strong connect to L.I.F.E. and lupus already. Your cousins don’t have lupus nor did they receive an award from us, which makes their actions speak volumes. And too much of society and the media shows negative events, while there are people like your cousins out there doing remarkable giving. They were thinking about how they could honor you and help L.I.F.E. on "their special day". My heart has softened a little more as a result of their actions and thoughtfulness." Since 2002 when L.I.F.E. was founded by two college students, Jodi Norton and Adina Gravit, L.I.F.E. has always made an effort to be involved with other lupus organizations/non-profits throughout the country in effort to show unity - together we can do so much! In 2002, while showing support at the Lupus Foundation of America’s Walk in New York, Adina met a young woman named Veronica Cruz. It was here that Adina told Veronica to apply for the L.I.F.E. Scholarship and the following year, Veronica become the recipient of the very first L.I.F.E. Scholarship. In 2006, Jodi Norton was asked to speak at the Southern Arizona Lupus Foundation’s Annual Luncheon. In 2014, L.I.F.E. began its Sponsorship Program and one of the first awards was sponsored by an Anonymous non-profit. In 2015, on behalf of Sjogren’s and Lupus Foundation of Hawaii, Mr. Kris Nakagawa sponsored a L.I.F.E. Scholarship for a student in Hawaii, Anissa LeeHang. From 2014-2015, Bianca Augusto (Vice President) showed her support by volunteering at the Lupus Foundation of America’s Walk in Tampa, Florida. This year’s awareness efforts involved two Rotary Clubs in Tucson, Arizona - the Old Pueblo Rotary Club and the Sunrise Rotary Club. During the month of May, also known as Lupus Awareness Month, Jodi Norton was a speaker at both of these clubs. Her presentation focused on removing the mystery surrounding lupus by informing the club members about this disease and also showcasing all the inspiring students that L.I.F.E. has helped over the years. As of 2015, L.I.F.E. has awarded scholarships to students in 35 states. By continuing to work and form partnerships with other nonprofits, L.I.F.E. hopes to award scholarships to students in all 50 states (and the District of Columbia) which further promotes its mission to bring lupus throughout the country. We want everyone to know that lupUS does not have to define US and there is always HOPE. Please help US to spread lupUS awareness - together we can do so much! Donations received until June 30, 2016 will be matched! Yet, most people don’t know much more about lupus other than it’s name. L.I.F.E. continuously strives to change the public’s awareness on what chronic illnesses are and the struggles faced by an individual with this disease. It’s also important for people to understand that lupus affects more than just the diagnosed individual - family and friends are also greatly impacted. Thanks to the generosity of our donors, over the years L.I.F.E. has awarded over 110 merit-based scholarships to students in 35 states. Awarded scholarships not only provide financial assistance to our inspirational students, but each award allows L.I.F.E. to successfully reach more of the general public through publications, social media, our website, and of course word of mouth from family/friends. In effort to increase these awareness efforts, an anonymous L.I.F.E. Board and Scholarship Committee Member has generously agreed to match all donations received now through June 30th (up to $2000) - this is just in time for the August 2016 L.I.F.E. Scholarships! Three easy ways to donate today! On behalf of World Lupus Day, L.I.F.E. 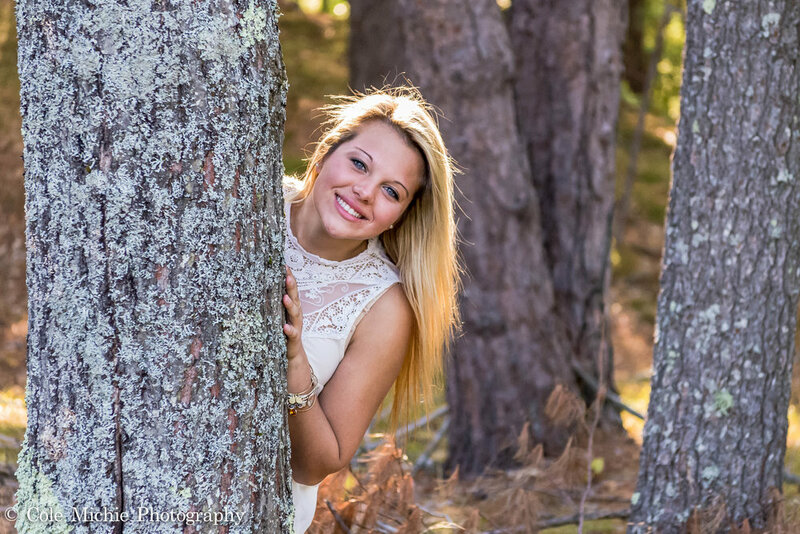 is excited to announce MACKENZIE HOOVER of New Hampshire as one of our recipients of the 2016 L.I.F.E. Awareness Award, sponsored by an Anonymous Individual Donor! These awards were created in 2015 in order to achieve the goal of awarding merit-based scholarships to students in all 50 states. Like many people with lupus, the road to a diagnosis was a difficult one for Mackenzie. She saw many specialists, many of whom thought she was making up her symptoms or that she sought rescue from an abusive home. "...it was at that point that I realized they too didn't realize I was truly in pain and this made me very upset. Just because I wasn't fitting into their textbook diagnoses, I must be a hormonal teenager looking for attention." After being visited by many specialists, including psychologists, Mackenzie found a doctor who recognized her symptoms as lupus and diagnosed her in less than 12 months. She has learned much on this difficult road, including perseverance and the need to be "[her] own advocate." Mackenzie says lupus will be with me for life, it is how I choose to live with it that will be my success or defeat." 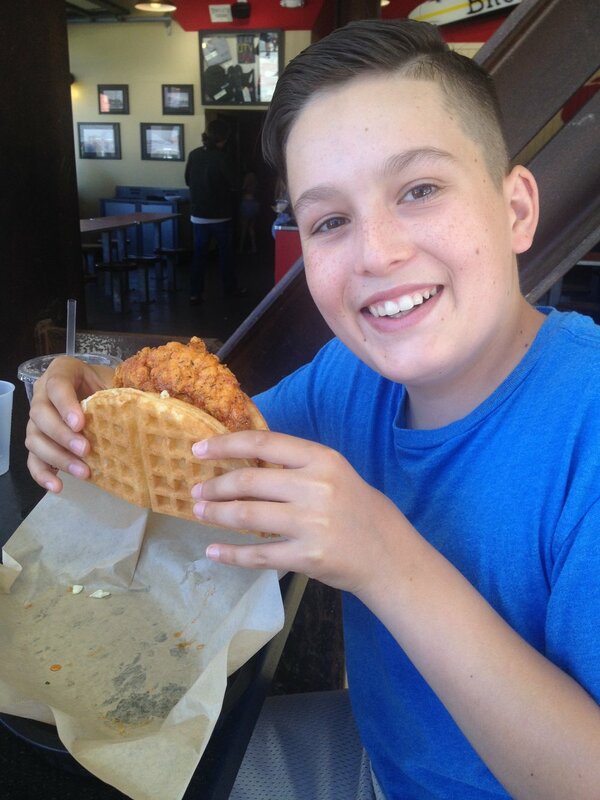 Click here to learn more about how you can sponsor an inspirational student like Mackenzie or send us an email at life4lupuscholarship@gmail.com. L.I.F.E. is taking part in the Jim Click Raffle for the third year in a row! L.I.F.E. is taking part in the Jim Click Raffle for the third year in a row! For 2016, the raffle is taking on a new meaning by allowing honorable past L.I.F.E. Winners to renew their scholarships while also helping a new student receive an award. Donors can also purchase tickets on-line to support L.I.F.E.